Last weekend during Big Meat Run (BMR) we saw an incredible amount of off-road fanatics and some of those fans also happen to be big lake enthusiasts! It's amazing that South Grand Lake has the ability to offer enjoyment for both wheeling and boating in our front and backyards! We're getting closer to the month of April and we hope you can join the 2019 Regal Private Event, hosted by Regal's President and Chief Executive Officer. Duane and Cindy Kuck invite you to their home for this special event featuring the eloquently crafted 3300, along with other great Regal models. Hardtops are designed to offer the best of both worlds: Fun in the summer sun and cool, shaded protection when you're ready to take a break from the heat. The convenient retractable shade built into every 3300 hardtop is versatility at it's finest! Don't leave anyone behind with the spacious cockpit layout allowing you to comfortably accommodate up to 18 guests. With storage available underneath the cockpit seats, store everything you need for your day on the water. 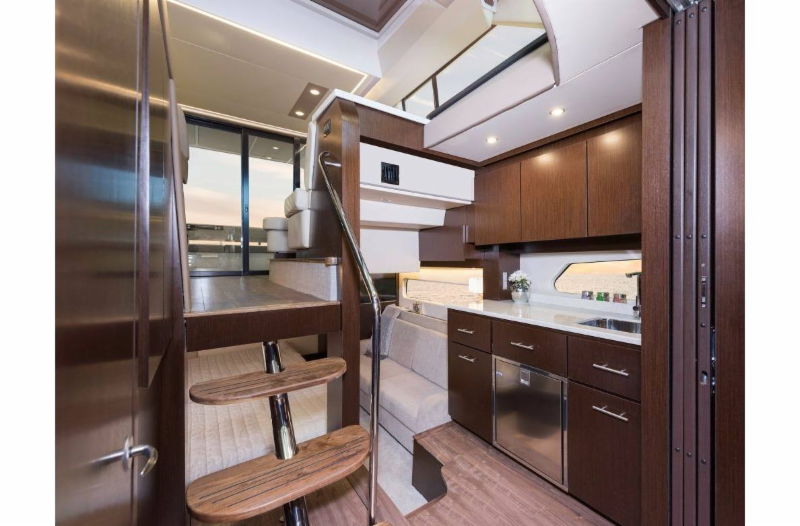 And let's not forget one of the most amazing features of the Regal 3300 - the openness of a bowrider and the additional quarter berth that includes a queen bed and ample space tucked neatly under the cockpit! The weather is going to be beautiful this week as we start to see more and more of our awesome customers back on the lake. Bring your family and friends to Cedar Port Marina for a popsicle, check out our new clothes, shoes, boat accessories, and..."Let's Go Boating"!! TIP OF THE WEEK: THE LAST DAY OF THE HARRIS BLACK TIE SAVINGS IS MARCH 31ST!!! COME SEE ME FOR A CHANCE TO SAVE BIG!!! Thanks and Have a Grand Day! WANT TO BROKER YOUR BOAT?? Call Jerry Cookson at Cedar Port, the home of Regal boats!! To see all of our boats for sale check out our website at www.cedarport.com. We had a beautiful weekend with sunshine and 60+ degrees! It really does feel like spring is finally here!! There were so many Grand Lake boaters in the ship store over the weekend and you all made our St. Patrick's Day a memorable one!! We thank you for the opportunity to meet and serve all your boating needs!! Join us this April at the 2019 Regal Exclusive Private Event, hosted at the home of Duane and Cindy Kuck, Regal Marine's President and CEO. This special event features the newly revealed 38 XO, along with other great Express Cruisers and Sports Yachts. Experience Regal's newest models firsthand, as well as a visit to the World Headquarters in Orlando, Florida. Enjoy on-the-water experiences on the new 38 XO and other Express Cruisers and Sports Yachts with captains on board ready to welcome you. Also, be sure not to miss a full factory tour with an exploration of more of Regal's newest models, such as the 42 Grande Coupe and 33 OBX and in the showroom. TIP OF THE WEEK: YOU DON'T NEED THERAPY....YOU JUST NEED YOUR BOAT!!!! Get on the schedule to de-winterize so you don't miss out on the fun!!! Thanks and Have a Grand Day!! Check out our newest beverages and latest gear!! We will be adding all your favorites soon!! New wine and craft beer is here or how about some mimosa's? We have new kids life jackets in stock as well as new Doomswell Surf Boards. The weather is going to be nice this weekend and I have a few new & used boats to choose from. Next weekend is the BMR in Disney. What that means is there will be 10,000 people and Jeeps here if you want to come people watch. TIP OF THE WEEK: WHO'S READY FOR THE BOOTLEGGERS BALL AT CHEROKEE ON APRIL 13TH? WANT TO BROKER YOUR BOAT?? Call Jerry Cookson at Cedar Port, the home of Regal boats!! To see all of our boats for sale check out our website at www.cedarport.com. What a great turnout we had for the poker run. My staff did an amazing job while I sat at the house watching the boats go by, one after another! To see a myriad of photos of all the fun, go to the FB Grand Lake Boaters page. Congratulations to winners Cris Wimer from South Shores Development; Cherrie Trevathan from Disney, OK & Cedar Port Marina; and Becca Curtis. A Full House, Flush, and Straight is what it took to win this year. This weekend on Saturday it's going to be 63 degrees and a great boat selling weekend. I have the all NEW Regal 3300 BR in stock and ready to deliver with more coming. 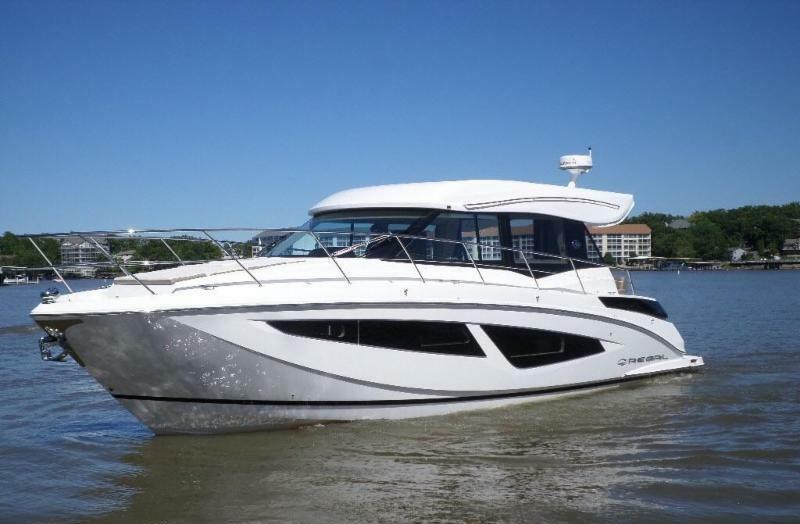 It's very attractive and popular with an open bow as well as a nice cabin. I really like the sun shade and the auto swim platform the most. I will have one out and ready for a test drive. Call my cell phone for an appointment or just drop by https://www.cedarport.com/new-models/2019-regal-3300-26790759b. TIP OF THE WEEK: It's time to come to the lake. Get your toys ready, it won't be long!! I hate to wait!!! WANT TO BROKER YOUR BOAT?? Call Jerry Cookson at Cedar Port Marina - home of Regal boats!! To see all of our boats for sale, check out our website at www.cedarport.com. Who's ready to hear some GREAT news? Cedar Port Marina is going to be the "go to" place on Grand Lake for wine and beer. Be sure to come by the ship store and place your orders. It's time for Welcome Back Weekend and the store is stocked full and ready to meet your boating needs. I will be making some crazy deals on clothing so stop here first on your Mardi Gras Grand Lake Style Poker Run. TIP OF THE WEEK: If you enter this door you will become a new boat owner. WANT TO BROKER YOUR BOAT?? Call Jerry Cookson at Cedar Port Marina - Home of Regal Boats!! To see all of our boats for sale, check out our website at www.cedarport.com. What great weather we are going to have this weekend! That's a great reason for everyone to come to the lake! We have all of our clothing on sale with new arrivals coming in daily! The theme for Welcome Back Weekend is Mardi Gras on Mardi Grand! Hope to see you there!! WANT TO BROKER YOUR BOAT?? Call Jerry Cookson at Cedar Port Marina - Home of Regal Boats! What a busy week it's been at Cedar Port Marina! After a record boat show, we have been doing sea trials and delivering boats at a fast pace. The lake is going to be busy this weekend with great weather. Drop by and say "Hi" and let's go drive a new boat for spring. If you have been thinking about buying a new boat for this spring, the time is now when the selection is at it's very best! TIP OF THE WEEK: The weather is going to be great and the eagles are flying in numbers below the Dam. Want to broker your boat?? Call Jerry Cookson at Cedar Port Marina, the home of Regal boats!! What a busy boat show we had for 2019! I would like to thank everyone that came out, as well as referred people to me. We sold almost every Regal in the booth. As always, I sold a few Cobalt's, as well as some tritoons and surf boats. Don't forget Welcome Back Weekend is right around the corner with the WBW Poker Run so mark your calendar for this fun event! Now that we have sold both of our Regal 42 Grande Coupes, I have found another one available for delivery before Welcome Back Weekend. What a treat it would be to have a new Regal GC https://www.regalboats.com/model/42-grande-coupe-sportyacht/. Jerry with Duane Kuck, President and CEO of Regal Boats, and his wife, Cindy. Welcome Back Weekend Poker Run 2018! Well, it's been cold all week, but I still managed to sell a few boats. What a great start to 2019. I have been selling boats at Cedar Port since 2002. What a fun ride it is. My customers know that this is the absolutely best time to buy because of the Tulsa Boat Sport and Travel Show and all the manufacturer Reps are in town dealing. I will have my best boats at the show to see and buy. The selection is it's very best right now. I have been buying new boats, to the tune of 100, since October in order to be ready for this event. With the best selection and the show going on it makes a great combination for you to make a decision! Family time in a boat is priceless. The Regal booth will be the place that I will be most of the week, but I am trained in every brand. Don't forget to reach out for a private showing starting today! Check out the Regal fast trac hull, if you're looking for a runabout. This helps with fuel efficiency and speed, up to 20%. The centerpiece of the show will be the Regal 42 Grande Coupe. This boat has all the Great Features you would expect in a yacht like the full beam retractable sun roof, as well as an additional swim platform that comes out from under the existing swim platform with the push of a button. Drop by and see me January 28th through February 3rd! I would love to see you! Wow! 2018 was a GREAT year! I want to give my customers and employees a BIG thank you! Now it's off to 2019 and the Tulsa Boat Show! This is the absolute best time of year to buy a boat!! All the manufacturers are looking for new business and are really competitive. We are taking 40 plus boats to display and we look forward to seeing everyone! As always, I do private previews before the show on Sunday, January 27th, so give me a call and you can get an exclusive showing! WANT TO BROKER YOUR BOAT? Call Jerry Cookson at Cedar Port Marina!! To see all of our boats for sale, check out our website at www.cedarport.com!! What an amazing time we had here this past weekend on Disney Island. We had three boats in the parade that were from the marina. I want to extend a special "thank you" to Amy and Jeff Flanagan, Cliff and Randi Wright, as well as Regal boats for participating and representing the south side of Grand Lake. There was some impressive work and incredible decorating on all of the parade entries. I want to thank all my customers for the RECORD year at Cedar Port Marina, and my staff - Amy, Robert, Lori, and the many seasonal employees for their dedication, hard work and excellent customer service. I also want to thank Joe Harwood for the vision and confidence in south Grand Lake. Most of all, I want to thank my family for their support and understanding of the many hours and weekends and the opportunity to enjoy this amazing lake life! The weather has been nice. It reminds me of the Tulsa Boat Sport and Travel Show. This is my favorite time of the year to sell because of the Toss Us Your Keys Program, as well as the Harris Black Tie Program. You can beat the rush and get your order in now before the demand is at max level. Some boats just won't make it in before Memorial Day, if we don't start planning now. See you at the Polar Bear Plunge on Saturday! Want to broker your boat?? Call Jerry Cookson at Cedar Port! The home of Regal boats! Well, as I reminisce here in my office, I am getting more and more excited about this weekend's events. The polar bear plunge has always been one of my favorite events! Like I have always said, "jump or donate"! Then move on across the lake to Cherokee for the Christmas parade. The dock party is always amazing as you can meet the captains and crew before we head off for a 'three hour tour' to the Dam and back again. The level of competition is just amazing! Nothing kicks the holiday spirit into gear like an evening with friends, family and boats lit up with sparkly holiday cheer!! I want to thank our sponsors that make it possible to televise this year again on four stations in three cities! I want to take a minute to welcome my 80 new customers on Grand Lake and thank them for the best year I could ever imagine! Another thanks to Cedar Port for the selection of Regal boats. It's just growing like I would never have dreamed. Regal is celebrating 50 years of being a family-owned company out of Orlando, Florida. They make boats ranging from 19 foot to 53 foot. This Regal boat is available for the Christmas parade all decorated and ready for year-round boating in luxury and comfort. LAST CHANCE TO RESERVE A SPOT - REGAL BOATS 50th ANNIVERSARY - EXCLUSIVE PRIVATE EVENT!! We invite you to an exclusive 2019 Regal private event! An invitation-only demo event hosted at the home of Duane and Cindy Kuck, Regal Marine's President and CEO. Join us December 12 - 15 for demos of the all-new 38 Grande Coupe, 33 SAV, and 35 Sport Coupe with captains on board ready to welcome you. Also, enjoy a full tour and exploration of more of Regal's newest models, such as the 42 Grande Coupe, 33 Express, and 33 OBX in the Factory Showroom. Sign up to be a part of this event by emailing jerry.cookson@cedarport.com or calling (918) 435-8250. Want to broker your boat?? Call Jerry Cookson at Cedar Port!! To see all of our boats for sale check out our website at www.cedarport.com! If you feel like coming to Lady Grand, the weather is going to be 68 degrees on Friday. I am going to have some boats uncovered and ready to go if you need a Grand Lake fix. Join us December 12th - 15th for demos of the all-new 38 Grande Coupe, 33 SAV, and 35 Sport Coupe with captains on board ready to welcome you. Also, enjoy a full tour and exploration of more of Regal's newest models, such as the 42 Grande Coupe, 33 Express, and 33 OBX in the factory showroom! Sign up to be a part of this event by e-mailing jerry.cookson@cedarport.com or by calling (918) 435-8250. Don't miss the Christmas Lights Boat Parade and Dock Party on December 8th, starting at 4pm at Cherokee Yacht Club. Want to broker your boat? Call Jerry Cookson at Cedar Port Marina, home of Regal boats!! What an amazing trip we had out to the Malibu dealer meeting in Palm Springs, California, and just missing the snow storm here in Oklahoma. It was fantastic as Malibu presented us with the president's award in customer satisfaction. Not only do we sell most of the tow boats, but most of all our service is rated #1. Anyone interested in a Regal boat? The Kuck family are opening up their lake front home in Orlando, Florida, for an exclusive 2019 Regal private event! An invitation-only demo event hosted at the home of Duane and Cindy Kuck, Regal Marine's President and CEO. Join us December 12th - 15th for demos of the all-new 38 Grande Coupe, 33 SAV, and 35 Sport Coupe with captains on board ready to welcome you! 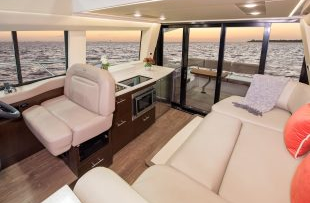 Also, you can enjoy a full tour and exploration of more of Regal's newest models, such as the 42 Grande Coupe, 33 Express, 33 OBX in the Factory Showroom. Sign up to be a part of this event by e-mailing jerry.cookson@cedarport.com or calling 918-435-8250. The Christmas boat parade is coming up on December 8th. This event will be televised again this year, but I encourage you to come out and be a part of one of the best dock parties on Grand Lake. Want to broker your boat? Call Jerry Cookson at Cedar Port Marina! Looks like the snow has hit Disney Island. I was lucky enough to be on a plane to California to attend a wonderful Malibu Boats Dealer Meeting. They introduced a new motor, as well as some new model boats, like the all new 25LSV. This weekend is the chili cookoff at Arrowhead...don't miss out, there willbe some amazing chili. See you soon on the Island! The unveiling of the 2019 Malibu 25LSV at the dealer meeting in Palm Springs, California. The all new 6.2L motor. Want to broker your boat? Call Jerry Cookson at Cedar Port Marina! To see all our boats for sale, please check out our website at www.cedarport.com. Our toss your keys program is in full swing as well as putting boats to sleep for winter. Now with the abundance of outboards on the lake and the new ways to drain stern drives, it's making boating on Grand Lake a year around adventure. The Veterans Day parades will be November 12th. I was raised by a retired marine and will always remember him teaching me respect for our flag and the USA. Cobalt boat display at the Fort Lauderdale boat show. Lisa and I want to thank you for a record season at Cedar Port and Sharky's. We would like to thank our teams that made it happen, and yes, we are still selling boats. If you have a boat you need sold, just call me at 918-691-8823. Check out the amazing sunsets we have been having. If you have a chance, join the Facebook page Grand Lake Boaters. It's growing fast with 1000's of people and pictures. As you can see, the fishing has been amazing. The marina has been really busy this fall. The colors are amazing!! Check out Greg and Cheryl's new orange Cobalt R7 Surf. We have the best sale of the year on ship store supplies and clothing. The dog is almost free. Wow what a picture perfect weekend we had. The flotillas are starting to be huge. Well, is everyone ready for Splash Bash with the band House Party? We sure are. Stop by Cedar Port for all your water saddles and rafts. We have them in all colors and ready for Splash Bash. If it's new swim wear or a new Yeti we have them too. With the 2018 model year in full swing the 2018's are starting to make their way to the many events on Grand Lake. Nothing's more fun than showing off your brand new boat at Splash Bash Saturday afternoon From 1pm-5pm in Ketchum Cove. Come check out all the new boats at Cedar Port. You might just find the perfect one for your grand entrance. If not, polish up yours and let's have a great time. After Splash Bash RPM is returning to Sharky's Saturday night at 7:30. I recommend you grab a pizza and a table up front . One of Grand lakes favorite bands will be playing to a full house. Monday, June 25 Malibu will be coming to Cedar Port for "Just Ride", a new cross country customer demo tour. Make plans to be there and check out he all new MXZ!!! My choice of boats to take to Splash Bash would be the all new Regal Grand Coupe. This boat has a fully enclosed cockpit with a full beam retractable sunroof to open up to the sun or moon. The back of the boat is perfect for Rafting out with its automatic underwater swim platform. It makes it perfect for getting in and out of the yacht. The galley has been moved up to the salon with a nice size ice box as well as a convection oven and cook top. There is also a charcoal grill for those over night trips. This boat is available at Cedar Port Marina home of Regal Boats. We choose Regal boat for Cedar Port because they make boats from 19 to 53 feet, and are a 49 year old company that has been absolutely debt free since 1989. Now that's a solid boat company that is family owned and family ran since day one. This is a great combination for a family owned marina. I have represented boats at Cedar Port Marina for the last 17 years. I will make sure to help you find the right boat and not sell it to you but help you select the best one for your family adventure's. To see all of our boats for sale check out our website at www.cedarport.com !